Merrilyn Merryweather lived in a small house on Hillendale Road, approximately a mile and a half past the square in the little town of Poppem, Connecticut. She and her husband Arthur had lived there for several years, ever since they both had retired from jobs at the feather factory in town. It was a nice house, with a very big yard. Merrilyn and Arthur had named their place "The Pony Ranch," and a small but distinct sign that said just that, hung on the same post that held their bright green mailbox. The name was Merrilyn's idea. When she had been a young girl, she wanted a pony in the worst way. Her parents had not thought it such a good idea. They had given her many toys and dolls and games, and were great parents in every way. But no matter how she begged and cajoled, they would never get her a pony. Eventually Merrilyn's urge for a pony passed, and she hadn't really ever thought about it again until she and Arthur bought this place. "I never got to have a pony," she would tell people. "But at least I can live on a pony ranch." 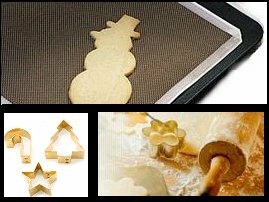 Merrilyn was busy one morning making Christmas cookies. Arthur had walked to town to the post office to mail off their Christmas cards, and to pick up some more chocolate chips and other baking supplies at Pederoski's store. Just as Merrilyn was about to put a tray of cookies into the oven, the doorbell rang. She grabbed a dishtowel, wiped her doughy hands, and went to see who could be calling at this time of day. Looking out the small window beside their front door, Merrilyn saw an old man standing at the doorway. He seemed to be dressed like a farmer. She opened the door and inquired of his business. "Is this the Pony Ranch?" the man inquired. When Merrilyn told him that yes it was, he introduced himself as Johnson Trebelhorn, the man who owned the Rocky Hill Farm over toward Morgansville. He said that he was getting out of the farming business, that he was just too old to keep up with it anymore. Since none of his children seemed to be interested, he was selling his livestock. "I have one old pony," he continued. "Got it for my grandkids when they were small, but now they're grown and aren't interested anymore either." Merrilyn said she didn't think they could afford to buy a pony at this time of year. "Oh, I wouldn't think of selling her. She's too old for that," said Mr. Trebelhorn. "I just want her to have a good home, and where better than at a pony ranch?" "Take the pony; take the pony; take the pony!" It was all she could do to hold back the giggles. "Won't Arthur be surprised?" she snickered to herself. And so she told Mr. Trebelhorn, "We would be pleased to take your pony. We'll see that it is very happy here at the ranch!" Mr. Trebelhorn promised to bring the pony over on Thursday, and then he was on his way. Merrilyn could hardly contain herself. "A pony at last!" she shouted out loud. "After all these years!" Arthur returned from the store about a half-hour later. As he unpacked his shopping bag, Merrilyn came into the kitchen. "Arthur," she told him, "you've got to build a barn out in the back. It has to be ready by Thursday." Quickly getting the feeling he had missed something, even though he had only been gone for an hour, Arthur asked his wife, "Why? What's going on?" He hadn't seen his wife this excited since she accidentally dropped their daughter Annabelle's pet hamster down the sink, and that had been a long time ago. "Have you finally bought a pony?" Arthur asked. "No, but old Mr. Trebelhorn from over at Rocky Hill is giving me a pony," Merrilyn answered. "But," she said, as she suddenly realized what Arthur had asked, "how did you know?" "You never really got over wanting to have a pony," replied Arthur. "Ever since we moved here, and especially after you insisted on naming the place 'The Pony Ranch', I just knew that someday you'd come home with a pony." Merrilyn had never loved Arthur more than she did at that very moment. Arthur thought it was a great idea, but he hadn't the foggiest notion of how to build a barn, especially by Thursday, since that was the day after tomorrow. The first thing Wednesday morning he went right on down to the lumber yard on Route 284 and purchased one of those little already-built sheds. The shed was delivered that very afternoon, and so were a few new fenceposts that Arthur and old Mr. Graham from next door put up across the back of the yard. And so the "ranch" was ready for its first pony. "Folks, meet 'Muffin,'" Mr. Trebelhorn said on Thursday as he unloaded her from his trailer. Muffin was reddish-brown, with a white mark on her forehead, and she was as friendly as she could be. She was a good old pony and was never a lick of trouble for Merrilyn or Arthur. They would let the neighborhood children ride her on special occasions, and one year they even entered her in the county fair. Although Muffin was old, and Merrilyn was too big to take a ride on Muffin herself, somehow, it just didn't matter at all. to finally have a pony to call her own! About the Author: Both of Jack Graham's parents were the children of pioneers. Jack is a great-grandson of immigrant steel-workers, and grandson of a veteran of the Boer War. Jack was raised in the hardscrabble suburbs of Pittsburgh, PA. Born unknowingly into the upper level of abject poverty during the midst of the second great war, he steadily raised himself to the lower level of reasonable prosperity in only half a century. Jack graduated from Crafton High School, and soon thereafter from the Penn State University School of Forestry. After an adventure in Thailand with the US Army Corps of Engineers, he married a girl from New Jersey and had two children. There followed a long and enjoyable career in the woods and wild places of Pennsylvania, out there “where the wild things grow”--places which are perhaps the inspiration for some of the tales he tells. As his children grew, Jack read stories to them, as any good parent must do, but Jack also told them stories from the reservoir of his own imagination. As his children continued to grow up, they became too old for bedtime stories told at bedside, but they never outgrew the need for good tales well-told. So, Jack’s tales were written down in book form--some were old tales remembered, and many were new. The book, Stories I Might Have, Meant To, or Should Have Told My Children, was presented to his grown children in 1995. It remains a work-in-progress with new tales constantly being added. Jack feels that good stories should be shared, retold, and passed on. We agree. Jack lives in Media, PA with his wife, Tobi and their dog, Duncan. Write to Jack Graham and let him know how much you enjoyed reading his story The Pony Ranch at Bedtime-Story. 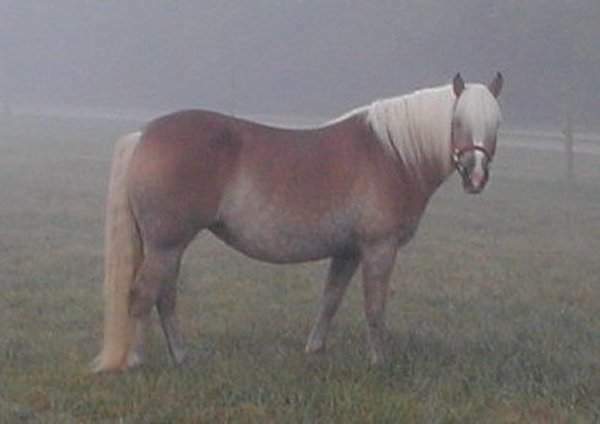 About the Pony pictured above: This breed of pony is called a Haflinger. Haflingers come in a variety of sizes and shades, but most haflingers range from 53-59 inches tall and weigh 800-1300 pounds. They are usually in a shade of chestnut ranging from very light blonde to chocolate solid or with dappling. 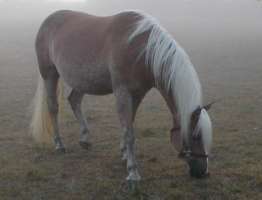 Haflinger manes and tails can be very thick and even double, and come in shades of white to flaxen. 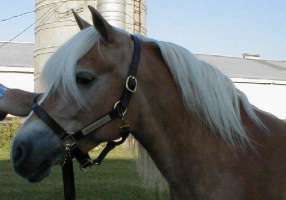 Haflingers are one of the calmest, friendliest, and easiest to train breeds of horse. They are very strong, yet shorter and not as intimidating as larger breeds. Haflingers were originally bred in Hafling, Austria, which is now a part of Italy. Haflinger horses are genuinely friendly to people, they have a willing attitude and a sincere desire to please. They are capable of doing the work of much larger horses, yet have a lower level of care and maintenance. They are easy keepers, long lived, intelligent and easy to train. A quiet steady horse, Haflingers are by nature calm, and as such, are especially suited for first-time horse owners as well as for children’s mounts. Bedtime-Story thanks the Haflinger breeders at Cedar Lane Farm in Eaton, Ohio for helping us to illustrate this tale. No hamsters were harmed during the writing of this story.